TBI Large Frame Leather Holster. $29.95. Exactly what I expected. Thanks for selling quality products. "Well made. Perfect fit. LOVE IT!" Well made. Perfect fit. LOVE IT! "Great fit for my Alfa training pistol." Great fit for my Alfa training pistol. "Holster seems like it will last through many decades of service." This is my first holster because gun was a gift to me from a friend. I am going to order the belt to go with the holster as well. Holster seems like it will last through many decades of service. 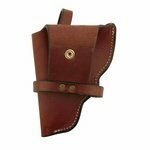 Great holster with a great price for a solid leather holster. Excellent quality fits my alfa 22 like a glove. like the solid click of the snap. put on my own safety cord. The pistol, when pushed into the holster as far as it can go, does not allow enough room for the top strap to snap over the grip to secure the pistol in the holster. Fits NEF, Champion, Alfa, GunX & Kimar blank pistols. 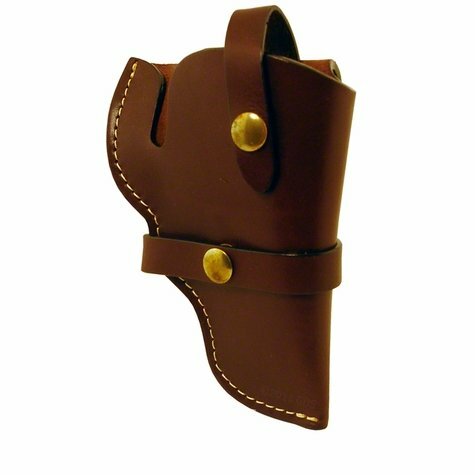 This holster is hand crafted, top quality saddle grade leather tanned to a deep mahogany finish and fitted with solid brass hardware. Features a snap for attaching to the TBI Gun Belt to keep it from sliding. NOTE: Some pistols fit very snugly inside this holster. If you can get the pistol started into the holster, press the barrel against something hard until the holster strap will snap. Leave the pistol snapped in the holster as much as possible until the leather forms to the pistol. This will make the pistol fit better over time. Made in the USA.